Rookie DE Trey Flowers had a monster game, but the New England Patriots dropped the preseason finale to the New York Giants 12-9. Neither the New York Giants nor the New England Patriots would score a touchdown in the final week of the preseason, with the Giants hitting one more field goal than the Patriots en route to a 12-9 victory. The Patriots would get deep into Giants territory twice in the final five minutes, but two Ryan Lindley turnovers would erase any hope the Patriots had of a victory. It was a relatively ugly game from start to finish, with very few big names playing for either the Giants or the Patriots. The star of the night for New England was rookie defensive end Trey Flowers, who absolutely dominated in every facet of the game - setting the edge, tackling, assignments, and getting after the quarterback. New England finishes the preseason at 2-2. But more importantly, the preseason finished. We're onto the regular season. Full highlights from the game below. Jimmy Garoppolo received the veteran treatment, with roster longshot Ryan Lindleygetting the start, and quickly generating a three and out. Veteran receiver Reggie Wayne received the start - likely to get more acclimated to the Patriots' system. Interestingly, LeGarrette Blount also received the start (and began with a 5 yard loss). On defense, veterans to get the start included Alan Branch and Logan Ryan. The Giants also began with a mix of reserves and starters in the game - notably Ryan Nassib starting at quarterback in place of Eli Manning. After a stop due to some nice pass rushes from Rufus Johnson and Trey Flowers, the Patriots had another three and out. On a positive note, Ryan Lindley did have a completion on this drive. Yay. On the punt, however, the ball bounced off a Giants player and the Patriots recovered the football. 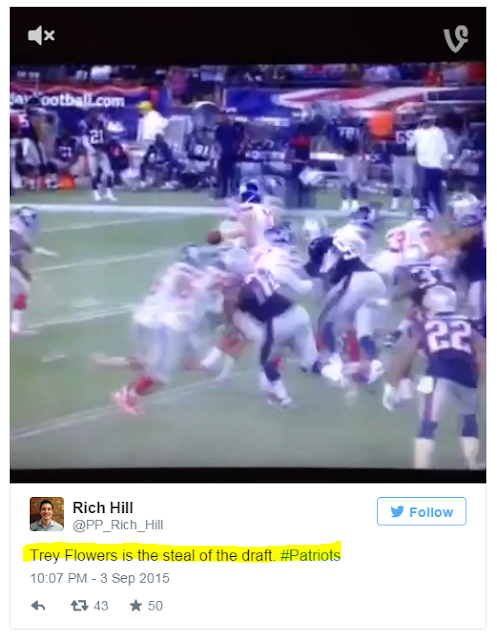 However, it was ruled Giants football on the field, and then inexplicably Giants football after a challenge. After a pair of penalties, the Giants would put 3 points on the board. The Giants got things going midway through the second quarter with a long completion down the sideline from Nassib to Geremy Davis. Dax Swanson fell down in coverage. 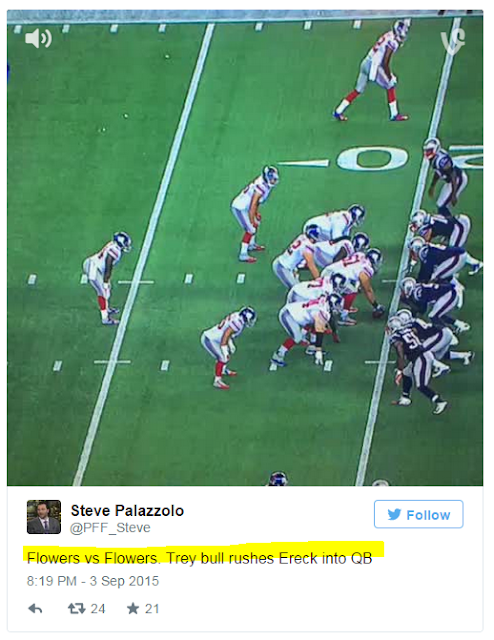 The Giants would eventually settle for a second field goal to bring the score to 6-0. Ryan Wendell did get some game action in, which was good to see. A little over midway through the quarter, the Patriots did finally put three points on the board, due to this big completion from Ryan Lindley to Aaron Dobson. Lindley would then barely miss on a long ball to Dobson in the end zone. However, a LeGarrette Blount 12-yard catch and run would set the Patriots up for the field goal to cut the deficit back to three. After a quick stop defensively, the Patriots put up another quick three to tie the game at halftime thanks in part to this great catch down the seam by Asante Cleveland. And now, we have just 30 more minutes to go of preseason football. Note a whole lot to report on from the third quarter. The Giants did tack on a field goal at the end of the quarter to gain the lead. So, points. The Patriots generated some momentum on offense to start the 4th quarter. Lindley found Zach D'Orazio over the middle on a third a long. James White made a couple of nice plays, and Stephen Gostkowski netted a 50-yard field goal to tie the game at nine. Flowers has been one of the consistent outstanding performers of the Patriots' preseason and has impressed every time he's taken the field. New England would make things interesting on the next drive. Chris Harper had a pair of nice snags in traffic to help move the Patriots down the field. Unfortunately, a 3rd down pass near the Giants' red zone would be overthrown by Lindley, resulting in a tip off the fingers of LeGarrette Blount and an interception for the New York Defense. The Patriots would get the ball back one more time due to a fantastic stack, shed and tackle for a loss in the running game by... guess who? Yes, Trey Flowers. On a 3rd and 8 on the Patriots' final drive, LeGarrette Blount had a 23-yard catch-and-run on a screen pass to bring the Patriots to a goal-to-go situation at the Giants ten yard line. Unfortunately, two plays later, Ryan Lindley would be stripped on his drop back, with the Giants recovering the fumble and securing the win.